The proportion of South Korean schoolkids who consider North Korea the enemy has plummeted over the past year, while that of youngsters who favor cooperating with or helping the North has surged, a survey said Tuesday. Jointly conducted by the Education and Unification ministries between October and December last year, the nationwide poll surveyed more than 80,000 primary and secondary schoolkids and 4,000 teachers. A mere 5.2 percent of schoolchildren said they view North Korea as the enemy, a remarkable drop from 41 percent in 2017. The rate fluctuates wildly depending on the prevailing wind, having been 26.3 percent in 2014, 31.8 percent in 2015 and 33.1 percent in 2016. Instead, the proportion of schoolchildren who favored cooperating with the North rose 10 percentage points to 50.9 percent. Some 20.2 percent said it needs to be watched with caution and 12.1 percent wished to help the North. But last year's poll gave "enemy" as its lone negative choice, but this year's study added the category "watch with caution." Asked what occurs to them when they think about North Korea, 26.7 percent ticked "dictatorship," a huge drop from 49.3 percent in 2017. 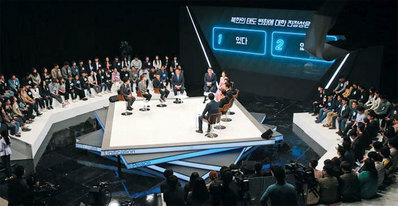 Those answering "Korean people/unification" reached 24.9 percent, a big rise from just 8.6 percent. Last year's three inter-Korean summits seem to have promoted a more positive impression of North Korean leader Kim Jong-un.